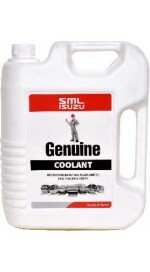 This product has been specially engineered for high performance- high efficiency SML Isuzu engines. Using other unapproved brands of coolant may adversely affect vehicle performance. 1. Drain the cooling system completely. 3. Pour coolant water mixture into radiator and expansion bottle till between the marks.